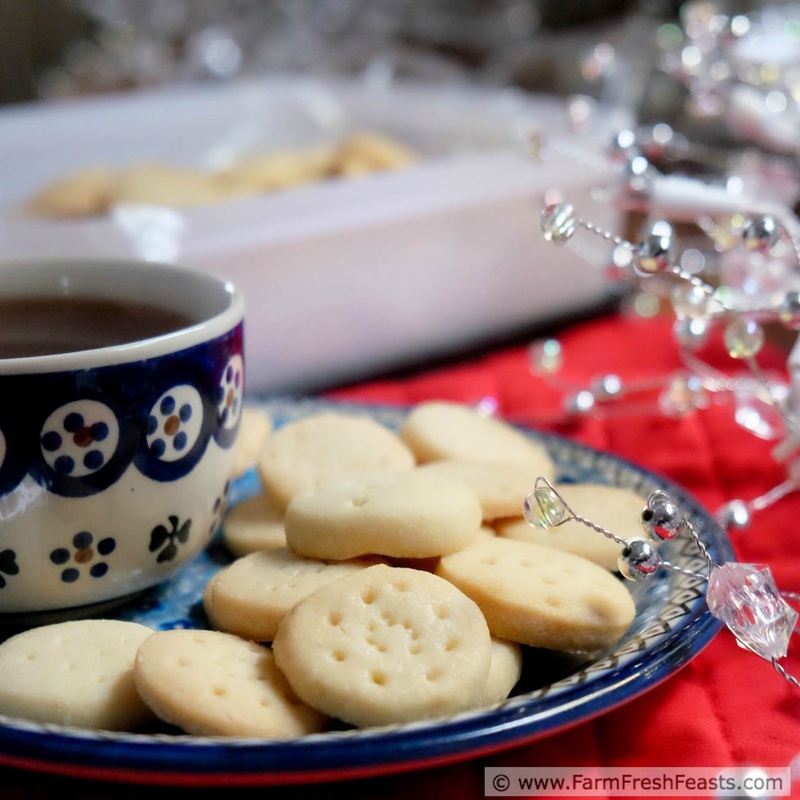 Scottish shortbread made the way my Scottish grandma made it--3 to 4 simple ingredients, small pieces, and plenty of time to ripen before serving. This is the ultimate make ahead Christmas cookie. Are you wondering what happened to the Community Supported Agriculture (CSA) farm share-centric recipes you've come to expect when stopping by the blog? I've been taken over by pod people in the form of joined with Kim of Cravings of a Lunatic and Kiss My Smoke, who is hosting #ChristmasWeek. Head on over to the Visual Recipe Index by Ingredient for veggie-centric recipes, and scroll down for holiday sweets! Many folks get their ethnic on especially during the holidays, and I am in this crowd. No matter if it's a new tradition or an old one, this time of year is the time to celebrate my heritage through food. Most of the holiday-specific recipes I've shared on the blog are Scandinavian [I even have a Scandinavian Holiday Pinterest board--follow me!] because 75% of my grandparents trace their lineage back to Scandinavian countries. The other 25% is my mom's mom. Alison Brown Grant emigrated from Scotland to Canada when she was 13, and from her I have my tradition of shortbread at Christmas time. 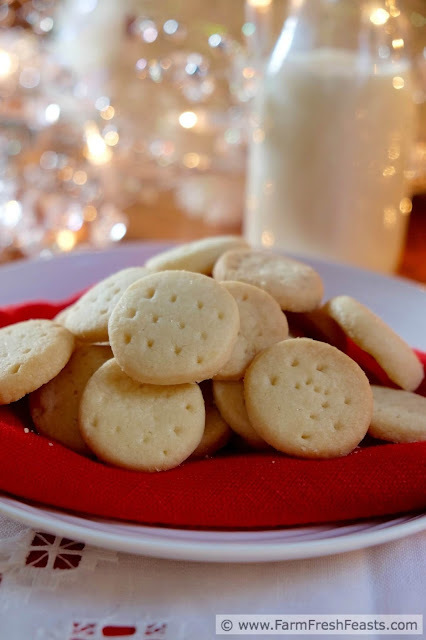 Shortbread is a pretty simple cookie--it's just flour, sugar, and butter. My aunt Ruth (mom's sister) added in the cornstarch, but My Mom's Sister's Version of her Scottish Mom's Shortbread is just not really an SEO friendly title. The key with shortbread is that it needs to ripen. Do not bake it and plan to serve right away. It will taste utterly boring and bland and is probably why so many people are in a rush to doctor it up with chocolate or nuts or something, which is silly. Appreciate shortbread for what it is, and be patient. If you put that plain cookie in an airtight tin and stick it in a cool dry place for a while . . . well, when you bring the tin back out a magical alchemy will have occurred and those 3-4 ingredients will have aged into a lovely little bite. 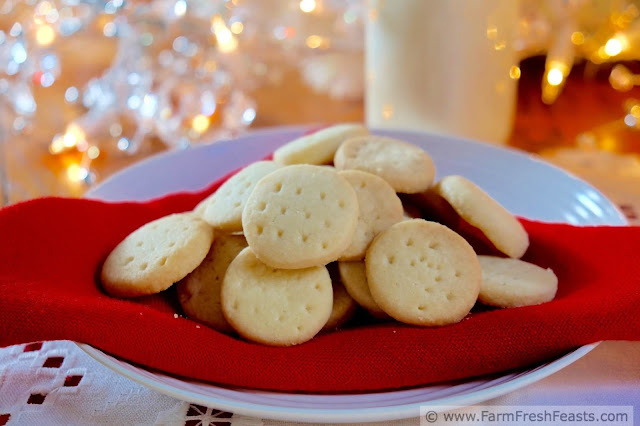 Growing up, my mom would bake shortbread around Thanksgiving weekend and store it, wrapped in plastic wrap, in coffee cans in the coat closet. She'd bring it out for the Christmas Eve smorgasbord and we'd enjoy it on the cookie tray alongside a bowl of Scandinavian Fruit Soup. One year she forgot about a tin, and she swears those 13 month old shortbread cookies were the best ever. Any cookie that gets better with age, that I can make in the early stage of the holiday rush, is a win in my book. Note: I use caster sugar in this recipe. I ordered it from Amazon during a flurry of Free Prime Trial shopping. Here's an Amazon affiliate link to the type I've used. My aunt used 'berry sugar' which is a Canadian term, and what you're looking for is a finer grind of sugar than straight up granulated sugar, but not as fine as powdered sugar. Another Note: I make the dough a day ahead, chill the dough overnight, bake another day, and let the cookies ripen in airtight containers in a cool dry place for at least 3 weeks before serving. One Last Note: My mom and her mom always used a corrugated edge cookie cutter which is probably in a box somewhere in my basement. Make these small, one bite cookies. In a large bowl beat the softened butter until fluffy. I used my stand mixer. In another bowl, whisk together the dry ingredients. Add about a third of the flour mixture to the butter at a time, working it in gradually. Wrap dough in plastic wrap and chill overnight or for a couple of days. On baking day, preheat oven to 325 degrees Fahrenheit. Use a piece of parchment paper for easy clean up or just leave the cookie sheet engrossed which is a Posh Nosh term for ungreased. Place dough on a lightly floured board. Roll out to ⅜ inch thickness. Cut with a small deep cookie cutter, dipping the cutter into flour as needed to keep it from sticking. Prick the cookies lightly with a fork because your mommy tells you to. Bake for 25 to 30 minutes until a very light tan. Cool on the cookie sheet. Store in airtight containers between layers of plastic wrap for 3 to 6 weeks before serving. Welcome to Day 3 of Christmas Week. This annual event was started in 2012, and is hosted by Kim of Cravings of a Lunatic. This year we have over 35 bloggers sharing festive sweet recipes for the event. I did not know this about shortbread but for those beautiful cookies, I will happily be patient. They are literally one of my absolute favorites. In fact, I will certainly get a box in my stocking this year from my mamma, and I've already picked up one for hers. Ah, traditions. Awww, I love traditions like that! I married into a 'chocolate covered cherries at Christmas' tradition which is pretty fun. Finding stocking stuffers is my favorite part of shopping for gifts during the holidays! Thanks! I still prefer the crinkle cutter shape that my mom used while I was growing up, but until I find the special place where I put it last . . . these will have to do. I never knew that about shortbread (that it's supposed to age). Your cookies are exceedingly adorable. I love the bite sized pieces. I love a technique that makes my life easier *and* makes the end result better. I have been looking for a great shortbread recipe to try, it looks like this is the perfect one! Anything endorsed by a Scottish Grandmother MUST be amazing!! I can't wait to try these. 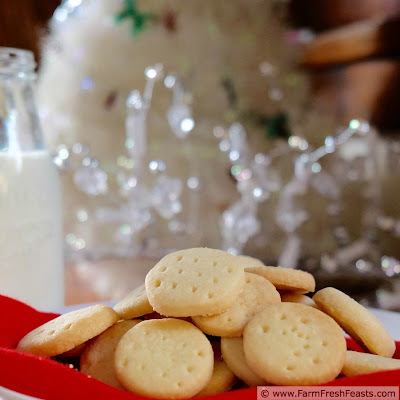 I love shortbread and this recipe is a must try. Your Nutella Ganache is on my Must Try list. It looks so good and is haunting me. I didn't have a Scottish grandmother, so I'm happy to borrow yours for purposes of getting a great shortbread recipe and keeping it alive in every corner of the shortbread-eating world. I'm happy to share my grandma's legacy!